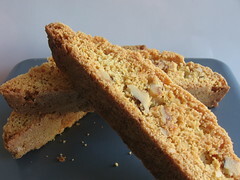 Walnut Orange Biscotti - Do You Know The Muffin Man? Notes: An easy recipe to mix up. The dough spreads out a lot, so make sure you leave lots of room on the cookie sheet. Let the partially baked logs cool sufficiently so that they are firm enough to slice with a sharp knife. I let the biscotti dry out for another half hour with the oven turned off. Very crisp and orangey, a fantastic cookie. Not sure if they would hold up to dipping though.